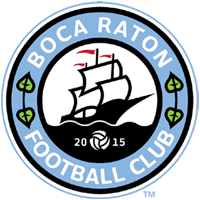 Boca Raton FC routed Miami Dade FC 5-3 in the American Premier Soccer League Semifinals on Saturday night at The Shipyard in Boca Raton in front of 475 fans. The regular season champions, Boca Raton, lost to this very same Miami Dade team back on May 15 which were their lone loss of the entire season. The game was physical and two yellow cards were handed to Miami before the visitors went ahead 1-0 in the 38th minute on a goal by Antonio Damasio. Boca struggled to break through Miami’s defense but Colby Burdette headed in the equalizer in the 43rd minute just before halftime. In the second half, the home team started off quickly with two goals, one from Giovanni DiMouro in the 49th minute followed by a Hassani Sinclair goal in the 58th minute. Boca was able to defend Miami’s pressure, largely thanks to a standout game from goalkeeper Derrick Santos. Burdette scored his second goal on the night in the 79th minute after several attempts from Boca that saw the home team keep possession for a large chunk of the second half. Boca was holding on to their 4-1 lead and seemed to grow complacent before Miami inserted themselves back into the game with two quick goals in stoppage time from Matheus Ayrolla and Kerlon Maour to bring the score up 4-3. The home team’s defense was able to hold on through Miami’s attempts to equalize and Tomer Bitton scored the final goal in the game, making the final score 5-3. With the win, Boca Raton will now face Uruguay Kendall in the APSL Finals on August 1 at Broward College. Boca defeated Uruguay Kendall in the final game of the regular season 4-3 to be crowned the Regular Season Champions.